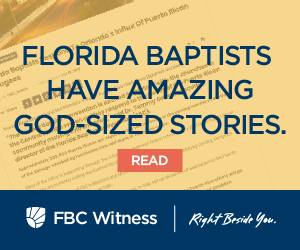 The 2018 Florida Baptist State Convention experienced a powerful moving of the Presence of the Lord. I sensed from the moment the Pastors Conference began on Sunday evening under the leadership of Pastor Erik Cummings that God was doing a special work in our midst. The momentum of the Pastors Conference flowed into the Florida Baptist Convention Meeting under the leadership of Pastor Stephen Rummage. The gathering of our Convention reflected the multicultural, multiethnic, and multilingual family that reflects our Florida Baptist churches. I am grateful for our State Board of Missions under the leadership of Pastor Mike Orr for the clear and concise manner that our business was presented and handled. I am appreciative of the outstanding work of the Committee on Nominations led by Pastor Ronny Raines as they presented our nominees for approval to serve Florida Baptists. The Committee on Order of Business led by Pastor Hal Kitchings working in concert with Dr. Rummage crafted under the leadership of the Holy Spirit a very dynamic program for those in attendance. I am very appreciative of Wayside Baptist Church and Pastor David Moore for hosting the Florida Baptist Convention. I am thankful for all who participated through serving, volunteering, and being present for this amazing meeting. The addition of the break out sessions allowed for practical learning opportunities on a variety of Kingdom related matters. The worship and messages that we experienced were anointed of the Lord. We are a family and this Convention reflected who we are as Florida Baptists. The consistent testimony concerning the 2018 Convention was in excitement to be part of this family, informed about our work together, encouraged to press on in Christ, and connected to a family across Florida. Thank you for praying and participating in our Florida Baptist Convention Family! !